Unconfirmed reports from local activists and credible human rights observers in Paniai have claimed that 13 houses have been burnt down as sweep operations by Indonesian security forces have resumed, causing panic amongst local Papuan civilians. The operation by a joint Indonesian army (TNI) and police unit, allegedly led by a large number of Detachment 88 troops (the elite Australian-funded counter-terror unit) is searching for Free Papua National Liberation Army (TPN-OPM) guerrilla leader Jhon Yogi, has begun with up to 13 houses burned to the ground, allegedly claimed by Detachment 88 officers to be TPN posts. Activists from National Papua solidarity (Napas.com) have reported that Detachment 88 (d88) troops began to raid houses across the area around Pugo village on January 7, from 11am local time. According to field reports, the searches lasted well into the night, causing many people in surrounding villages to flee the area in fear of their lives. Five Companies (approx 500 armed men) of the joint strike force (including one company of D88 troops) reportedly laid siege to the alleged headquarters area near Waididi Pogo of Yogi’s TPN-OPM Paniai region command on Monday. According to Napas.com, Yogi’s men returned heavy fire on the strike force. According to the local community members, the civilian houses in Pogo were burned quickly on Monday by rogue Indonesian military, together with plain clothes militia or Intel (military intelligence officers), according to SMS messages sent to the media. Since 13 December 2011, the Indonesian military forces have been regularly attacking, and systematically dismantling and burning villages and traditional buildings alleged to be posts or headquarters of the TPN-OPM Division II in Paniai. Community members have reported to Napas.com, the movements of Yogi have been well know n by the Indonesian military, who are allegedly using the situation to have a “show force with full war equipment”, using this opportunity to surround the new TPN headquarters. 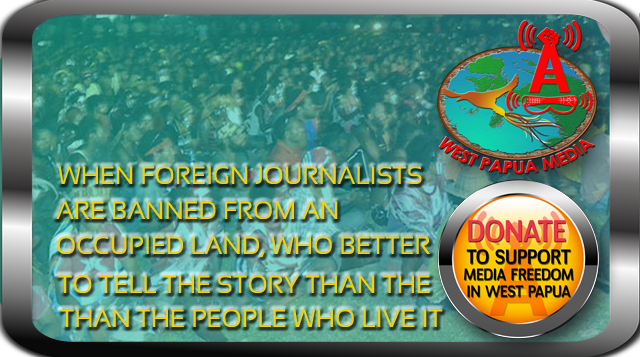 Separate reports received by West Papua Media,which have been unable to be confirmed to our verification standards, have claimed that “unknown persons” units have also fired on both civilians and military units. including gunfire that erupted from a suspected military source on a hill behind the Paniai General Hospital area at Uwibutu Madi. According to human rights sources, Paniai people are greatly fearing for their safety amid another escalation in military offensives. Previous offensives in the Paniai since December 2011 have displaced tens of thousands of civilians, and burnt down hundreds of villages.